After the glory years in New Age music, many deserted New Age music as its boring-ness and diluted therapeutic view ruined the epic elemental part of it. But a new wave of New Age artists is rising from the ashes along with elements of Electronic and Progressive Rock. This new fusion music is mysterious, sensational and sensual spiritual. It can be called contemporary classical or neo-classical, but I think this new wave deserves such a new name as “Rebellious New Age“. Listeners are responding more favorably to this new hybrid music, but the question is how presenting rebellion instead of relaxation affects listeners? Can it cause new riots in London or NewYork? Or as Rixa White, the masked man in white behind Silentaria musical project believes, Rebellion is the key to Emptiness. He encourages listeners to listen to his music for releasing the deep chronic sense of insecurity and dissatisfaction, rather than escaping, controlling, suppressing or denying it. 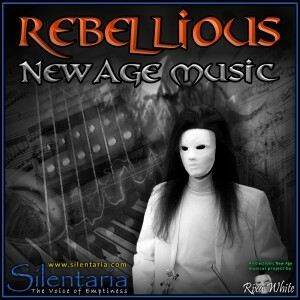 Rixa White, an unorthodox artist from the new wave of New Age musicians is the first to promote rebellion instead of relaxation in this genre, encouraging his listeners to connect with their rebellious part and question the beliefs fearlessly to awaken the inner rebel. His iconic image, a long-haired man in plain white, hiding his face behind a white mask visualizes rebellion against all masks that we wear in life, “One Mask to hide them all“. His sensational rebellious music sounds like a revenge against usual soft titles in New Age music. He insists on facing the life burden as it is and not pretending that everything is fine outside while suffering inside. “By this way, we do not need to hide our true-self and stop throwing ourselves into good mood”. Rixa White believes that music can be a cure, if we let ourselves into a pure experience beyond our conceptual beliefs and observe both frustration and frenzy, witness them all and embrace the infinite possibilities that are unfolding from Emptiness. As the first New Age artist that promotes rebellion instead of relaxation, he uses his sensual music as a vehicle to encourage doing things outside the rules. He believes persuading a particular constant belief will lead to conformity and obedience.